Just over 56 thousand people live in Greenland, a pseudo-autonomous nation that belongs to the Kingdom of Denmark, and takes up two million square kilometers of North America, making it the least-densely-populated state in the world. Nearly 90 percent of the population are Greenlandic Inuit who belong to three ethnic groups—Kalaallit, Tunumiit, Inughuit—that speak three distinct Eskimo-Aleut languages; the rest of the population are European, largely Danes, and nearly everyone is fluent in Kalaallit and Danish. Greenland is thus historically, demographically, and linguistically unique in the Western hemisphere, since no other postcolonial nation-state in the Americas boasts a majority-indigenous population still speaking an indigenous language, let alone three, and with a thriving indigenous-language literary scene—as Greenlandic author Niviaq Korneliussen's example demonstrates. Such things happen in Africa, Southeast Asia, and the Pacific, where settlers were less successful in literally replacing the indigenous populations, even as colonialism still wrought its innumerable horrors, forcibly converted whole societies, reeducated them, and sought to erase indigenous languages in favor of English, French, Portuguese, Dutch, Spanish, and so on. But because of the more complete genocide of the indigenous populations of the Americas, very few indigenous American authors get to write in their peoples' languages and fewer still rise to literary fame in that manner. Last Night in Nuuk is Korneliussen's third novel. Its story is at once familiar—with its trials of young love, late-night parties, urban exploits of twentysomethings, and betrayals of close friends—and unfamiliar—glimpsing the lives of urban Greenlandic Inuit that most readers outside the Danophone world know nothing about. Moreover, in its English translation, Last Night in Nuuk is an excellent example of contemporary literary fiction: it shifts perspectives and in doing so offers multiple views on a set of overlapping events; it blends forms that have imbricated themselves in our everyday lives, including text messages, emails, and online news headlines; and it deals with pressing social issues in a hip, sometimes stream-of-consciousness manner that ethnographically explores problems like homophobia or the pressures of/against coming out, without necessarily commenting on why these issues exist or how they might be combated. 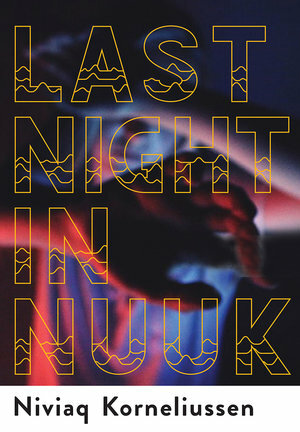 Last Night in Nuuk takes place over the course of a few weeks in Greenland's capital and largest city, Nuuk, and is chunked into five chapters that each offer a different character's perspective, slowing adding texture and context to the novel's three pivotal events: a meeting, a betrayal, and a reunion. Because the story is told character to character, and mostly in first person, the ordering of chapters affects how the reader interacts with the story, so that Fia, whose chapter is first, appears to be the central protagonist. Reading on, we learn that she is in many ways unconnected to some of the novel's structuring moments; she barely knows her roommate, doesn't realize her journalist brother Inuk is dealing with his own internalized homophobia as a gay Greenlander, nor that her roommate Arnaq betrayed Inuk's confidence about a gay relationship, forcing him to flee to Denmark. In fact, we don't learn he has left Greenland until the second chapter, his own. Fia is more focused on her budding bisexuality and newfound interest in Sara. As the reader progresses and discovers the internal lives of more characters, they take on new dimensions. Ivik, for example, is at first a background figure, but becomes pivotal as Arnaq has an affair with her and as Sara, her then-girlfriend and romantic interest of Fia, discovers she has cheated—and that she is in fact a transgender man who has yet to accept himself. Despite the turbulent traumas and dramas that animate most of Last Night in Nuuk, the novel ends with everything seemingly resolved: Inuk is out and self-accepting (or else, perhaps, has died; the novel is unclear, but ultimately renders this ambiguity positively, as in the beautiful, polysemous last lines of his chapter: "Finally, I am home. / Homo. Sapiens. Inuk. "); Fia is out and together with Sara; Arnaq has largely recognized the source of her alcoholism and begun to cope with the trauma of past sexual assault; and Ivik has accepted himself as a man. Not all of these are traditionally "happy" endings, but they all suggest futures for queer indigenous Greenlandic Inuit peoples, a way forward, a cluster of intersecting and very different utopian impulses. Korneliussen's writing represents an important intervention in global, indigenous, and postcolonial literary discourses of queerness, and of the millennial generation and its transnational resonances in global city life. As a novel by an indigenous author originally written in an indigenous language, yet published under a last name that to most Anglophone audiences reads as generically "Scandinavian", and about a nation with a history known to very few American readers, Last Night in Nuuk is likely to confound expectations. Is it Scandinavian? Is it indigenous? Why do its characters read as uncannily familiar, their problems not unlike "our" own? To answer questions like these, and to pull back from making the sort of universalizing claims about "human experience" that are, ultimately, unhelpful, Korneliussen needs to be more widely read. Indeed, Korneliussen represents a growing contingent of boundary-defying Arctic writers who cannot—like Tanya Tagaq—be limited by such denominators as "indigenous" and "postcolonial". The reader looking for the magical realist writing that blends Western and indigenous cosmologies, and which has become a generic expectation of indigenous writing among non-indigenous readers, will instead find that Last Night in Nuuk is more like a Greenlandic version of the Friends sitcom (NBC) with lots of queer brown people (and even the indigeneity of the Greenlanders, the subtle hints about Danish vs. Greenlander, and what that means in a postcolonial context, might not be lost on most readers). Korneliussen reminds us that indigenous writing is not, does not have to be, and never truly was one thing. Though I don't think Korneliussen can be hailed for having created her own genre, as some Danish critics have remarked, Last Night in Nuuk is a nonetheless "novel" novel—a rarity in the post-postmodern age that is so far beyond "make it new" that most literary writers don't know where that modernist phrase came from. If Last Night in Nuuk is representative of Korneliussen's writing oeuvre, it's not a stretch to say that she is an important literary voice of our generation.